I was sitting on the porch of our cottage outside of Beulah, reading a book about the saints, when up came a volunteer friend: a chocolate-colored lab, friendly as you please. He clicked across the porch, nuzzled up to me and put his head on my lap. So there we sat, Buster and me (he seemed like a Buster), him being petted, me petting him. I put down my book, as Buster was rather dominating my lap. “Breakfast in 10 minutes!” Andrea called from the kitchen. Ah, 10 minutes. Such a nice long time. I closed my eyes, Buster under my hand, listening to the mid-morning countryside. Birds, the occasional faraway car, another dog barking, nothing. I immersed myself in the summer stillness. All motion seemed to have stopped. The very idea of 10 minutes seemed to lose meaning. It was just me and Buster, on the porch, while time took a break. I have the idea you can slow time down if you make a point of it. Buddhist monks seemingly can bring it to a halt by slowing their heart rates in meditation. Buster was being my Buddhist monk here, inviting me to slow my mind down. Instead of racing ahead mentally to the next thing, I just sat there with this thing, this moment. The more I sat, the larger the moment became, swelling into the warming summer air. There was no next thing, except that invitation to breakfast, at some point. There were other such moments in my long weekend with Andrea. 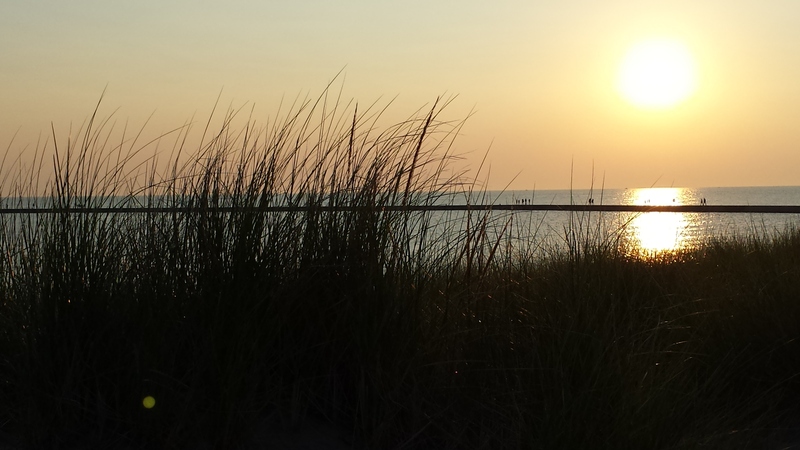 Sitting on Frankfort beach, we huddled on a bench waiting for the sunset. It took a long time. 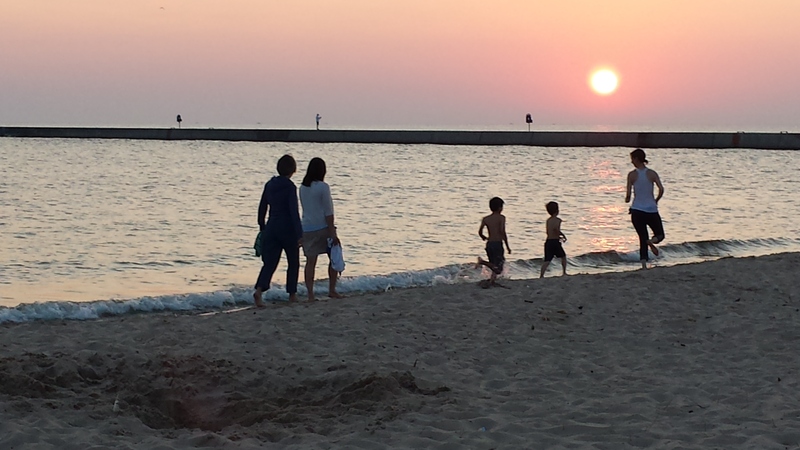 Children ran by along the shore. Adults snapped memory photos. The waves whooshed in dreamily. Birds circled. Andrea and I sat there sleepily, as the golden sun sank ever so perceptibly toward the horizon, slowing all the world with its lazy splendor. It would not stay so slow. Soon enough we were back in the rushing week, driving and working and taking care of the next thing and the thing after that. Things that needed doing by a certain time or else. Or else what, exactly? I guess we know. But what a life it would be if we could just let time dissolve into the still air, and let the deadlines wash away in the waves. Put my day in perspective. Thank you!